Alexander Souri has taken to travel among other things, he hasn't forgotten philosophy. About his yesterdays and todays Souri reiterates that there are no unfulfilled dreams, he is still getting over the fact that he is living one right now. For tomorrows, Souri knows that the future belongs to those who believe in the power of their dreams. For his own tomorrow, he is open to anything positive that appeals to him. He has lived and studied in India, France and the US, traveled extensively around the world and is the founder and executive director of Relief Riders International (www.reliefridersinternational.com), a unique adventure travel plus charity organization. 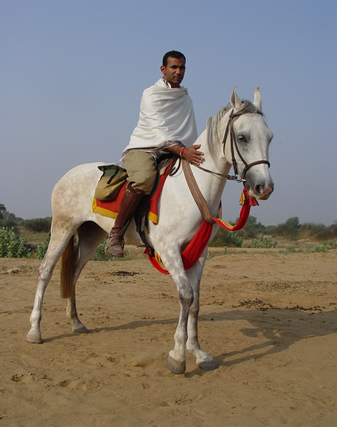 In October, Souri picked up 15 riders from various countries, who, for 15 days, would ramble on horseback through five villages in the Thar desert of Rajasthan. The adventure travellers would be joined by Red Cross personnel and doctors who would treat thousands of villagers along the route. For others there would be cheer, the Riders would distribute medical supplies, food and dozens of goats to the underprivileged. There is so much that Souri does that it is strenuous to pick one that he actually does for a living. Ask him that and he would say, "I have chosen to live in the best ways I know how!" But it was not always so. Not when he was not even eight and his father packed him off to Sherwood College in the foothills of the Himalayas. "My father wanted me to get a deep-seated sense of my roots. The discipline was tough and making the cultural adjustment at that age played an important part in the growth of my character", he says. Souri admits that this decision did not sit well with him at all "but I returned to the school after 20 years, and realized how positively the school had affected me." Life took an interesting turn when Souri became the producer for Innovation Arts, the company that was hired to build the Bullet Time Camera system (the wrap around signature shots) used predominantly in the first Matrix. film. They built models for the films in Massachusetts and shipped them to Australia. The work in The Matrix was followed by X-men, where Souri and his team spent weeks doing onset special effects installation. Souri loves traveling and talks passionately about his travels to India, the country that "still affords me the freedom in simple ways." But travel is not just about passion and pleasure. "The extensive travel at an early age made me realize how similar and yet how different cultures are. It gave me a broader understanding of the world, and has allowed me to be a part of it in so many ways. Relief Riders International serves as an organization that bridges the cultural divide in a time of war and geopolitical instability. It is important to keep hope alive, and exhaust every opportunity for growth and understanding." The idea of combining relief with adventure "stemmed both from a waking and sleeping dream. My father's loss set me off on a journey in which I was circumnavigating my soul. I wanted to be able to live my warrior archetype, while affecting positive change in very real ways. I wanted to be able to give back without compromising on my lifestyle. India is my father's country; it is also the country in which I drew the greatest qualities of my character. The ride is a tribute to my father and the love that bestowed on me during my life." And this tribute would soon extend to South America and Africa where Relief Riders would kick dust and bring cheer to those who need the most. Even though Souri has taken to travel among other things, he hasn't forgotten philosophy. About his yesterdays and todays Souri reiterates that there are no unfulfilled dreams, he is still getting over the fact that he is living one right now. For tomorrows, Souri knows that the future belongs to those who believe in the power of their dreams. For his own tomorrow, he is open to anything positive that appeals to him.